Congregation Beth Shalom Napa Valley had its beginnings during World War II as “The Napa Jewish Group”, meeting in member’s homes. 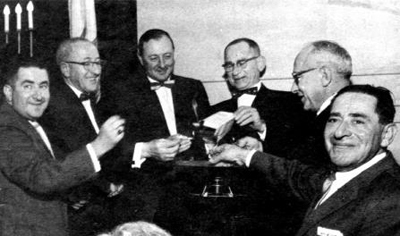 We organized as Congregation Beth Sholom (CBS) in 1953. 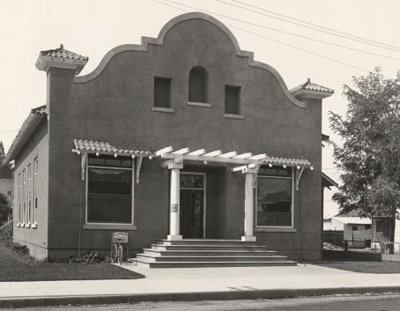 The synagogue purchased the old Chamber of Commerce Building, which was moved through the streets of Napa to its present site at 1455 Elm Street, near Old Town Napa. 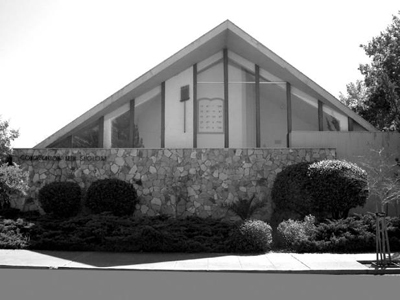 In 1963 a newly remodeled synagogue was dedicated on the present site and a swimming pool was constructed in the early 1970’s in order to serve as the Jewish Community Center of Napa. In 2014 CBS completed construction of the new Synagogue which still sits on its original site at 1455 Elm Street. The entryway to the building is constructed from the beams found in the attic of the original Chamber of Commerce building. The Ark and the Ner Tamid were remodeled from those that were in the Sanctuary from the 1963 remodeling project. The congregation was an independent synagogue for the first 50 years of its existence with part-time rabbis and lay leaders as religious staff. Volunteers served admirably for the religious school and committees during that time. We are the only synagogue in Napa County. In 2002, the Congregation voted to become affiliated with the Reform movement and in 2003 hired its first-ever full-time Rabbi. In the latter part of 2003, the congregation hired a part-time cantorial soloist, which when combined with the duties as director of education/ youth programming became a full-time position. In 2003 a building on the premises, which had served as a caretaker's home, was remodeled to house administrative offices and the Rabbi’s study. Also at that time, a part-time administrator was hired to oversee secretarial and financial tasks. Our religious school is a small dynamic program, which serves our children. Shorashim pre-school is a cooperative parent-run program that meets weekly on Sunday mornings. The religious school includes grades K-7 and Hebrew School, grades 4 – 7 B’nai Mitzvah. A number of volunteer and youth group (YACHAD) opportunities exist for all post-B’nai Mitzvah teens. This program has been stagnate for the past few years and will be reenergized in 2018. Congregation Beth Shalom is a member of the Napa Interfaith Council and is a founding member of The Table (over 20 years), a non-sectarian program that helps feed Napa’s hungry. Camp Chaverim day camp has served the children of our community for many years and has taken this year off but will be reactivated in the summer of 2019. We have participated in a literacy program for the mainly Hispanic students attending Shearer School, located across the street from the synagogue. We have an active Bikkur Cholim group known as CBS Lotsa Helping Hands. Since we have been a Reform congregation we have offered a wide array of worship that appeals to those of different ages and Jewish backgrounds. This year (2017) Rabbi Niles Goldstein, CBS’ full-time Rabbi and Director of Education will hold regular Shabbat Services on Friday evening on the 1st and 3rd Friday of each month followed on Saturday morning with Torah study. On the 2nd Friday night each month a potluck Family Shabbat service will be held and on the 4th Friday of each month, services will be lay-led. This is in addition to Life Long Learning/Adult Education programming, fundraising events, and Jewish holiday services. Our celebration dinners feature everything from latkes to Chinese Food (Erev Navidad on Dec. 24!) and are often accompanied by the landmark wines of the Napa Valley, many made by our own members. A history of the Napa Valleys Jews from 1848 to the present is documented in Napa Valley’s Jewish Heritage by Donna Mendelsohn and Henry Michalski. An exhibit of the Jews of the Valley is part of the Land and Its People at the Napa Valley Museum in Yountville.